Originally posted on Bloomberg View. If the phrase “too much of a good thing” applies to anything, it surely applies to antibiotics. Their discovery was one of the most important medical advances of the last century, but overuse has eroded their effectiveness. There’s widespread agreement on the need to speed up development of new antibiotics, and to discourage doctors from prescribing them for infections they’re not needed for. Another side of the issue is more contentious: roughly 80 percent of antibiotics are fed to farm animals. Regulators say using them to fatten livestock faster helps spread drug resistance. The European Union banned them for that purpose in 2006. The U.S. Food and Drug Administration would also like to end the practice, though the measures it’s proposing are voluntary. Meanwhile, about 50,000 people a year die in hospitals from drug-resistant infections in the U.S. and Europe, with millions more falling sick, and an untreatable strain of gonnorhea has spread to 10 countries. There’s action in Washington on both sides of the equation — trying to limit overuse and finding replacements for medicines that have become less effective. 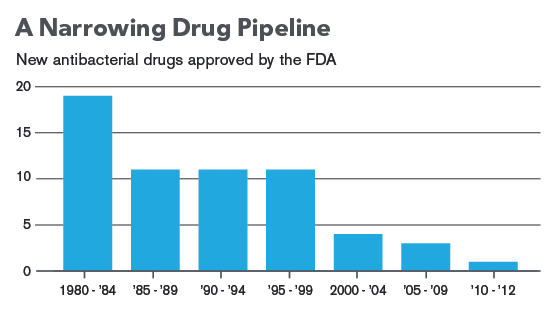 In 2012, Congress passed legislation creating incentives for drugmakers to come up with new antibiotics, including faster review and extended protection from generic competition; some new bills would go farther. Health officials report some success in campaigns to limit inappropriate use by humans — per-capita antibiotic use in the U.S. dropped about 15 percent between 2001 and 2010, and it’s beginning to drop in China, where consumption is 10 times as high. The FDA is also pushing to limit antibacterial hand washes, arguing that they don’t improve health and may be contributing to resistance. On the animal front, the FDA in December asked drug companies to voluntarily relabel antibiotics to phase out their use to speed growth. Eventually, farmers will no longer be able to purchase antibiotics in bulk, and they will only be approved for use on sick animals with a prescription from a veterinarian. Democrats have proposed an outright ban on giving the drugs to healthy animals. In the U.K., a report prepared for the government said that resistance could kill 10 million people a year globally by 2050 and called for coordinated international action. Charles Darwin would have understood the rise of drug resistance. Bacteria are constantly mutating, and some change in ways that let them survive a particular treatment. Repeated exposure leads to more of the resistant bacteria. The antibiotic era in animal agriculture began in 1946, when researchers noted that chickens fed low doses of the drugs grew faster. (Scientists still can’t agree why.) In 1972, an FDA task force warned that antibiotic-resistant microbes in animals could be passed to humans. For decades, the livestock and pharmaceutical industries successfully fended off regulation, arguing that little correlation could be drawn between antibiotics used in agriculture and resistant infections in humans. Health officials have become increasingly skeptical of that claim. There’s no doubt that antibiotics have become a crucial part of factory farming – animals in cramped conditions would be vulnerable to infections without daily doses of the drugs. Other threats include the increasing prevalence of counterfeit antibiotics, which feed resistance, and a drop in the number of drug companies pursuing research in the field, from 20 in the late 1990s to four in 2013. The FDA says its voluntary relabeling strategy will reduce antibiotic use in livestock faster than a ban that would take years to push through. Zoetis, the animal-health company spun off by Pfizer, and other drugmakers said they support the move, and industry groups such as the American Meat Institute applauded the voluntary approach. Some consumer advocates criticized the plan as a hollow gesture. A similar program by McDonald’s has been found to have loopholes that have raised questions about its impact. EU officials say they have seen some decline in antibiotic use since the 2006 ban, though the effect has been muted by higher rates of illness when herds aren’t taking them to promote growth. Denmark put a ban in place earlier and has seen a bigger drop — partly because farmers learned that they needed to raise their animals in healthier conditions once they weren’t getting a daily dose.